You must make reservations at least 5 minutes in advance of the time at Red Salt at Ko’a Kea Resort. 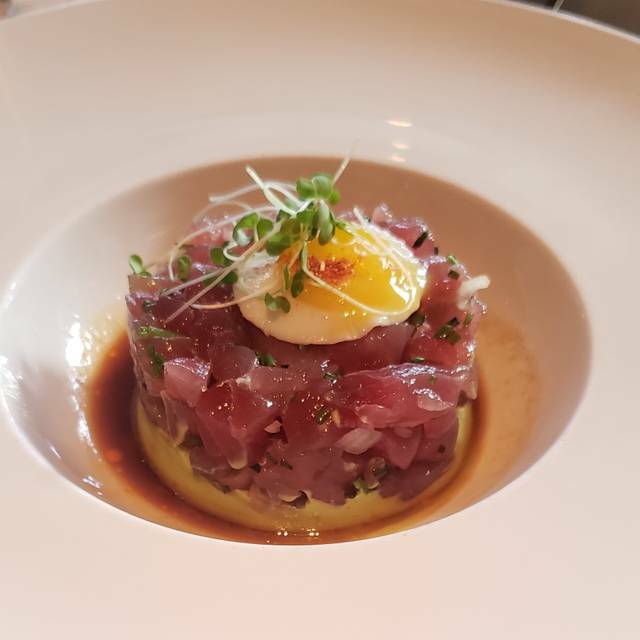 Red Salt’s diverse menu by acclaimed Executive Chef and Kauai native Noelani Planas celebrates fresh Hawaiian seafood and produce in a casual, yet sophisticated seaside atmosphere. Modern dinner cuisine including vanilla bean-seared mahi, ahi tartare, and the decadently layered Red Salt burger are served in a contemporary setting. The Red Salt Lounge is host to a sushi bar featuring the day’s freshest catch in innovative, isle-inspired rolls. Lounge and sushi bar seating are not available for reservation and is first come, first served. During morning hours, Red Salt offers tropical takes on traditional breakfast dishes, such as lobster benedict and lemon-pineapple soufflé pancakes, recently featured by Food Network. *Consuming raw or undercooked foods can increase your risk of food borne illness. We have been here many times and visited pretty much every good restaurant out here and this is the best by far. Doesn't get any better! This was one of the best meals I have had. Both my Husband and I’s dishes were amazing. I had the filet mignon and he had the tasting menu with the lobster gnocchi. Truly one of the best meals we have had. The food and plating was Spectacular!!! This is our absolute favorite restaurant on Kauai. The food/menu and quality is not surpassed here and there are a lot of good restaurants. This is a standout for us and we eat here multiple times while on vacation. It’s a very special place to our family. In the 10 years since it's opening, Red Salt has remained one of our favorites. 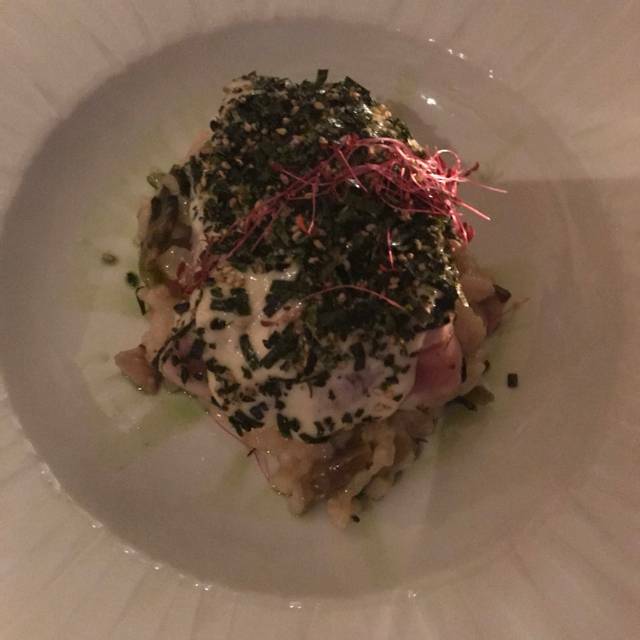 The blend of local fresh fish with creative ingredients is why we are always happy to return. 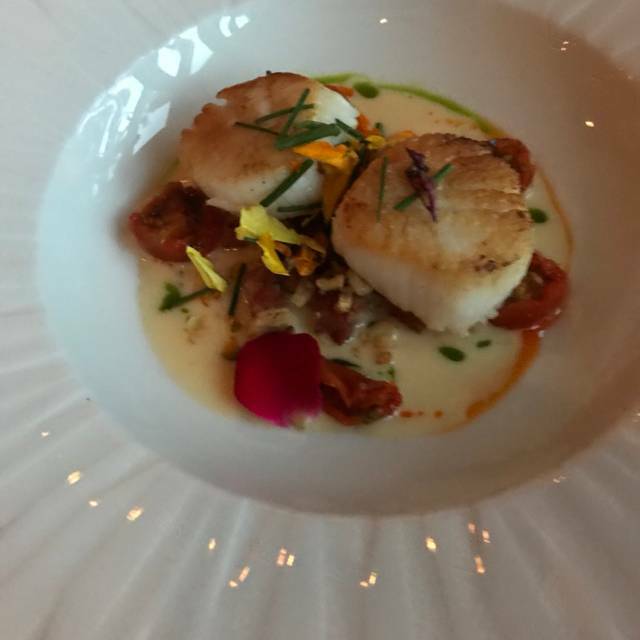 The mushroom bisque is delicious and Red Salt is the only highly rated restaurant in the Poipu area serving seared scallops. The forbidden rice is always perfectly prepared with a delicious sauce. Looking forward to returning again. The Kauai shrimp pasta, and short ribs were fabulous! Be sure to say yes to bread with butter and red salt. The GM was present, graciously doting and service oriented. I love this place. Thank you! We were prepared for the high prices but our expectations were not met in some other areas. The food was mediocre. The tasting menu serving was a smaller portion than the regular serving. The lobster gnocchi was tasteless. The butter fish was tasty but note that it is spicy. The filet mignon was cooked as ordered and adequately flavored. The soft shell crab appetizer was good. The loudness is overbearing. It’s almost easier to hear the conversations at other tables than at your own. The highlight was the service. Chris was attentive and accommodating. We had an amazing experience! 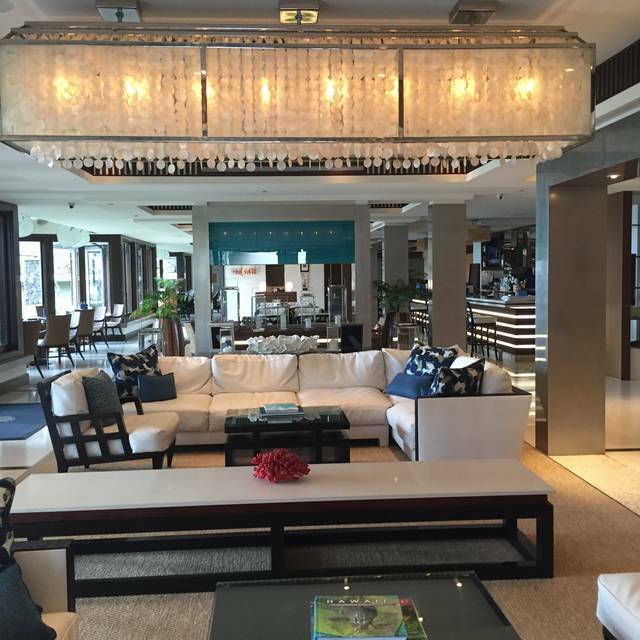 The service was top notch- everyone was very accommodating, kind, and happy. They made an effort to get to know us and ensure our dining experience was exceptional. We started with the ahi special appetizer which was good. Moved onto salads, my wife had the kale and I had the tomato salad, again both were really good. 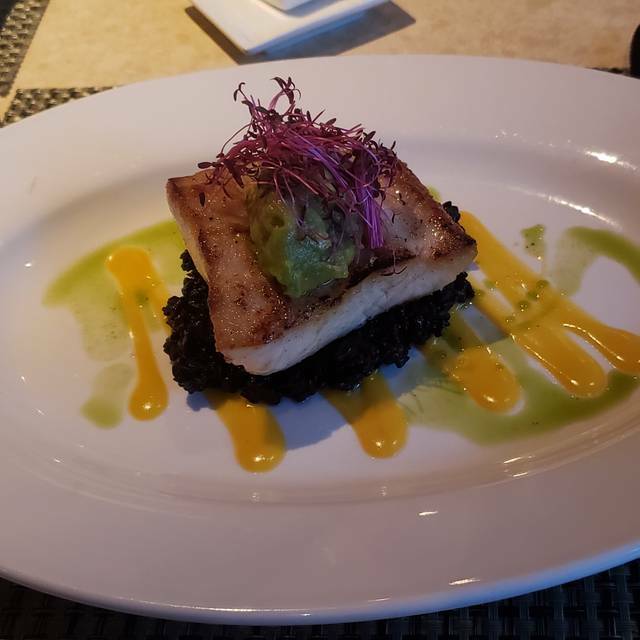 For main course my wife had the butterfish and I had the mahi. Again both were prepared perfectly. Desserts were the chocolate mousse and the Red Salt cake. Our server Chris was very helpful and attentive. Overall a wonderful dinner. We stayed at the Ko’a Kea hotel, it was five star all the way. The pool food was top notch. Service staff was great. Hotel was clean and friendly. We expected the same from the restaurant for dinner and were underwhelmed and overpaid. Wait staff was not friendly, Ok but was too expensive for the basic menu. My husbands meal came 15 mins after everyone else’s and the burger was over cooked. It was provided complementary due to the wait, but was not what we’d expected after other reviews. They do not serve sushi on sundays and mondays. The food is consistently good; we try to hit this once a month. The service (Eric) was friendly, informative, and efficient. The "lobby feel" can be a bit sterile, but stay focused on the food and service and you won't be disappointed! Red Salt has been our favorite restaurant on Kauai for a number of years now. I’m happy to say it remains so. Food and drinks are excellent, reasonable wine list, great friendly service. We will have dinner there again before returning home. Our favorite... not inexpensive, but is so worth it. Starts with great people - like Paul/manager and staff like Jamie and Chris - and continues with great environment, and then amazing & delicious food. The best place for a special event, or if you just want to treat yourselves to an experience that is extraordinary. LOVE this place. Thanks again. 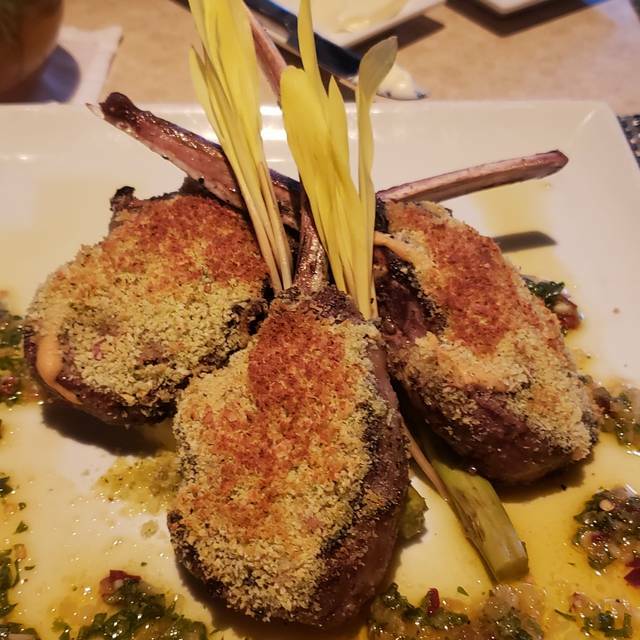 Excellent atmosphere, cuisine and service! Romantic! Nice meal. Good service. Restaurant is on first floor and not really separated from check in and bar area, but ambience was still nice. Thought it was a little higher priced than value received, but still enjoyed the meal. The consensus seems to be, among locals, that this is way over-priced and not worth it. They are so wrong! Devore isn’t all that special and the prices are up there, but service and quality were stunning. Started at the bar with Kirsten serving drinks. She was making all of the restaurants cocktails herself and did an amazing job. Seriously, many of the specialty drinks are pretty involved, so she was impressive! Seated about 20 mins after our reservation because other diners were lingering, but server Chris made sure we got our orders in before the kitchen closed not rushed at all. The food was gorgeous and delicious. Easily the best food we had the entire week on Kauai. They do have sushi but only in the bar. The food was phenomenal my compliments to chief Keola! And our server Zach made the experience that much better. First class service from all the staff members, will definitely be coming back. We had a fabulous waiter and now I’m embarrassed that I don’t remember his name. Nate? Zach? Tall, cool glasses! So efficient and fun and accommodating. We had a wonderful evening. Missed the cotton candy but the buratta made up for it! Dining experience was pretty darn good. We had coconut curry bisque and charred octopus for appetizer. Both were fresh and good. 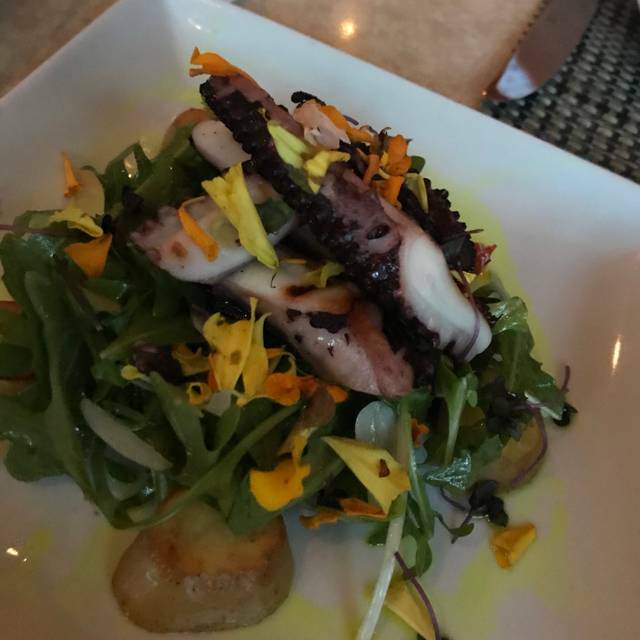 We’ve been spoiled by the octopus at Adega in San Jose California which was amazing, and that notwithstanding, this was pretty good. My wife had miso butterfish and I had ribeye. The butterfish was very delicious with good preparation and the ribeye was well cooked. I am in the keto diet so the fattiness was perfect for me but if I weren’t on keto it may have been a bit fatty. She had red salt cake for dessert and it was great per her - not too rich/sweet. The service was on point and everything was just right! We had a wonderful dinner at Red Salt. The food is really delicious and something for everyone on the menu, many GF items and a separate vegan menu. Bryan our server was truly a delight, he was friendly and efficient and went out of his way to accommodate special requests from our party of six. He was one of the best servers we’ve encountered in our travels. Mahalo to Dave the bartender too!! We can’t wait to come back to Red Salt. Outanding food and service. Celebrated my wife’s birthday and she was very pleased with her entree which was the lobster gnocchi. All of the entrees were delicious as was the scallops appetizer. One of our favorites. We visit every time we stay here. Food arrived very slowly. Salad was expensive and didn't have many add-ins besides the greens. Miso butterfish and short rib entrees were excellent. 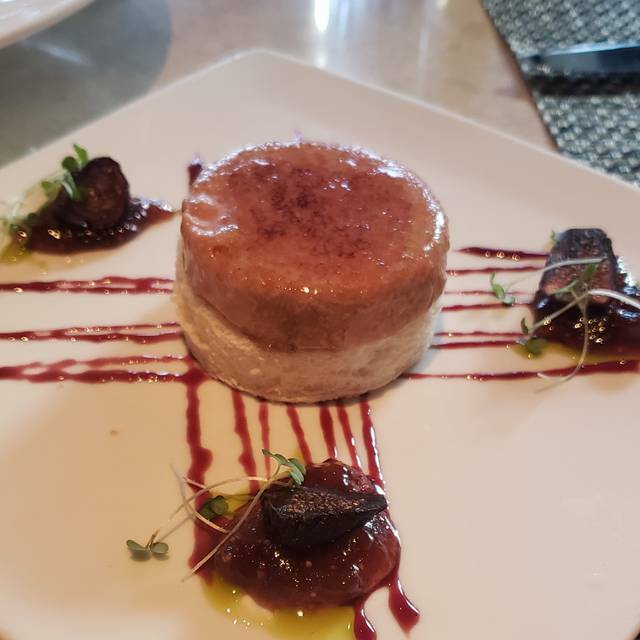 Lillikoi cheesecake was unexceptional. Server was functional but not overly friendly. Delicious Eggs Benedict. The service was impeccable. Great setting. Loved every minute. Thank you. The food was wonderful. The service was outstanding. But the noise level got so high we couldn’t hear much and just wanted to leave by the end. They could really use some acoustic tiles or something on the ceiling to help reduce the noise once the restaurant fills up. We have been going here for years as a 1x per trip fancy dinner. Entree's were the best, soup (shrimp curry) and dessert (chocolate mousse) were expensive and nothing special. Shrimp curry had 1/2 a shrimp and 1/2 a bite of mahi mahi - seriously? Drinks were $20 and watered down and just flat out bad. Not even too sweet bad...just bad. My wife liked the lobster gnocchi a lot, but got sick that night - either from that meal or the drink. I had butterfish and it was overcooked. Pretty disappointed, going to have to find another spot next time. Anniversary dinner...perfect in every way! $50 hamburgers - you got to be kidding. Everything is over priced. Service not very good. Wine selection poor. This is “fine dining” at its finest. A lovely ambiance, interesting/well prepared food and a truly wonderful, well trained wait staff. My personal bugga-boos are being rushed without a pause between courses and having dishes removed before everyone at table has finished. Our waiter was brilliant..it was as tho he was reading our minds...plenty of time to enjoy conversation and our cocktails before our appetizer magically appeared!! The entire meal was well paced allowing time to savor each before moving on to the next. Well done...we can’t wait for our next visit before we have to return home. Over-priced for the quality of food and ambience. I had the red salt burger. I see what they they were trying to go for, but I felt the whole thing came out a mess. I really didn’t like the flavor mix and could barely finish my $50 burger! Fries were just ok. As were the salads. 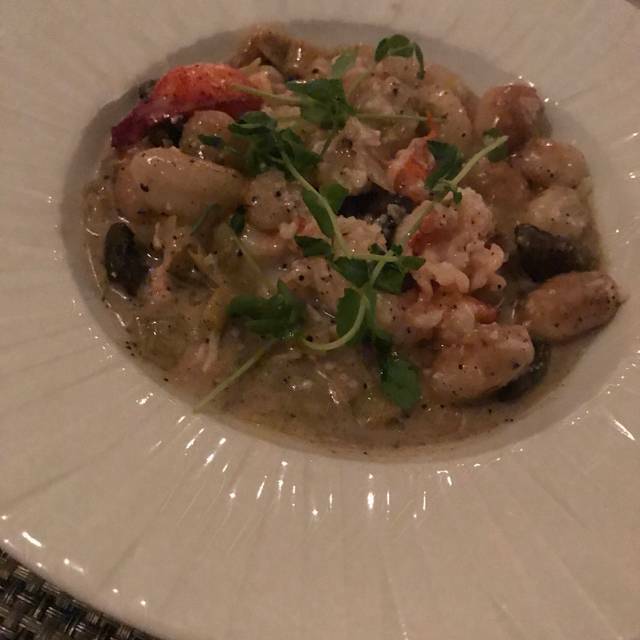 My wife had the lobster gnocchi. It was also heavy (too much butter and cream) and the lobster didn’t feel fresh. The view was also limited as u only look out to the pool and the surrounding buildings limit the view. Amazing food! We had the octopus as an appetizer which was my favorite dish. The service was also excellent. The food at red salt was amazing! One of the best dinners we had. Very pricey. Not a great atmosphere since you are in the lobby of the hotel and no view. But overall a nice dinner. This was the best meal we ate in a week on Kauai. All of the seafood dishes we had were excellent - scallops, Mahi, and the lobster gnocchi. Our server, Chris, was personable and made wonderful recommendations, including wine pairings.